Can You Use Super Glue to Heal Cuts and Scrapes? You've likely used Super Glue to repair broken ceramics, mount wooden frames or stop runs in nylon stockings. But Super Glue and medically-approved versions of cyanoacrylates (the chemical name for these adhesives) have an important use for helping fix your cuts and scrapes. While you may be used to putting in your hardware drawer, it may be time to add a tube of one of its FDA-approved cousins of this powerful adhesive in your medicine cabinet. There is a long history of the use of cyanoacrylates for wounds. Formulations of cyanoacrylate were tested for use in creating clear plastic gun sights during World War II, but they were too sticky. However, medics started using it to close wounds on the battlefield and less-irritating formulations were further field tested during the Vietnam War. After that, Super Glue was seen as a quick, reliable way to protect soldiers and prep them for transport. Medics saw it as the best option in the absence of hospital-grade materials, as it was less scarring, could be used quickly, and was waterproof. In 1998, FDA approved a medical adhesive formulation named Dermabond (2-octyl cyanoacrylate) which is less toxic, four times as strong in bonding, and has plasticizers to improve flexibility. 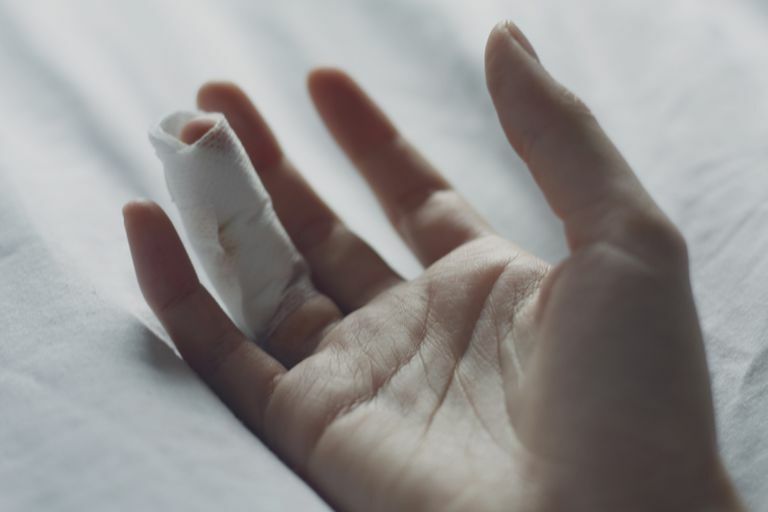 Now, doctors say clean cuts, such as paper cuts, knife cuts, and other minor cuts, are good options for using medically-approved forms of cyanoacrylates such as Dermabond, SurgiSeal, and Band-Aid Liquid Bandage. If you've ever gotten any Super Glue on your skin you know the clear adhesive dries fast and stays put. It also keeps air and dirt out of the wound and helps small skin cracks or small cuts, like a paper cut, heal. The glue not only stops bleeding quickly but also protects the skin from scarring. Eventually, the glue wears off, by which time the wound should be healed. Although using Super Glue might work in a pinch, experts say it can irritate the skin. Regular Super Glue has side effects that are not desirable for those using it for medical reasons. Not only does it irritate the eyes, throat, nose, and lungs, but it also damages the tissue surrounding a cut. To avoid these side effects, use a medical grade super glue meant specifically for minor cuts and scrapes. Even the medical formulations should never be used on deep wounds. Deep wounds must be cleaned, disinfected, and bandaged to stave off infection and ensure bleeding is stopped and the skin heals evenly. These adhesives should not be used on jagged wounds, bites, or punctures. They should not be used on joints, hands, feet, armpits, perineum, or mucosal surfaces. They shouldn't be used on any contaminated wounds. For a safer wound-healing glue consider Dermabond, which is approved by the FDA for skin wound closure. You can also use a semipermeable dressing (Tegaderm, Bioclusive, Second Skin, or New Skin) to cover the wound and attach the dressing to dry healthy skin with adhesive tape. The dressing should be changed every few days. Keep the wound moist until it has healed. A moist environment promotes healing, improves tissue formation, and protects the area from infection. DermaBond Summary of Safety and Effectiveness Data. Food and Drug Administration. https://www.accessdata.fda.gov/cdrh_docs/pdf/P960052b.pdf. Should Super Glue Be in Your First Aid Kit? Mayo Clinic. https://mayoclinichealthsystem.org/hometown-health/speaking-of-health/should-super-glue-be-in-your-first-aid-kit.